At Hudson Animal Hospital, we understand that the bond you and your beloved feline friend share is invaluable and irreplaceable. We also understand that by nature, cats are roaming creatures and therefore run the risk of wandering too far from home, or just accidentally losing their way. In fact, a staggering number of cats are lost in the shelter system each year because they lack any means to identify them with. This is why we are happy to offer cat microchip identification services. My Cat Needs An ISO Starndard Microchip For International Traveling. What Type Of Microchip Is This? If your cat travels internationally, most countries require your cat to have an ISO standard microchip, which is a 15-digit microchip. We carry ISO standard microchips for your well travelled pet. For other types of microchip please contact us. How Can I Set An Appointment To Have My Cat Microchipped? 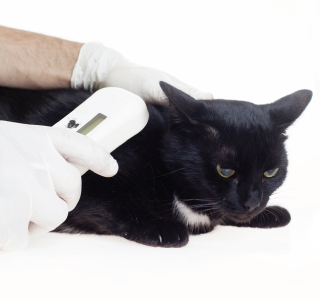 If you are ready to schedule an appointment for cat microchipping services, please contact us today. Our staff would be happy to help you register your feline friend with the pet recovery service database. Schedule a microchipping appointment today!